We named her Bernadette. There was a small christening ceremony. And we did our first pizza a couple of weekends ago in her hot little belly. There is something about a yeast dough that you've punched down yourself. You've lit the fire and gotten it going with aged birch logs they dumped near the house and that he stacked neatly under the stairs by the garden in a kind of Alpine monument to home and hearth. You've adjusted the air flow in the stove, got it burning nice and hot. The smoke tickles your nostrils and it also tickles the dough you've rolled out and slid into the hot oven. The heat seems to melt the mushrooms, crispen the paper thin sliced chorizo, and brown the dough even as it stays moist and warm inside with that come hither smoke flavor. This will not be the last. I am going to the paper shop to pick out a blank book this evening before they close. I am going to cover it with the fabric cuttings leftover from the kitchen door curtains, and fill it with the recipes and stories. Tips and tidbits of information, observations from the garden, and stories I may want to remember in the coming years as we continue this most interesting journey. Sarah and Erica both, come claim your prize! Yeah! You chose my name! :) I hope that you enjoy Bernadette for many more years to come! Okay you had me going for a second there. I am so excited to see you finally use it. I got so interested in yours after you posted the photos that I have been trying to find one for us by scouting around! I think it's a fabulous replacement for a fireplace in a house and you can cook in it. I can't wait to hear more about what you make in it (uh sorry...*her*) because Seb doesn't seemed convinced that it will be something we'd actually use for cooking but I know better. It just looks perfect. I had no idea a "bernadette" could be used to cook pizza. I had one in my small kitchen, a long time ago, and we had to put it away to accommodate a new oven. It looked just like yours, it is a wonderful piece of furniture. We kept it, you give me some new ideas now. I have been reading silently for some time. You really have a beautiful and inspiring blog. What a thing of beauty! Mouth-watering! What does it take to get an invitation from you for dinner? I'm available anytime! Horray, you named her! Bernadette is very fitting. Great name for a stove! 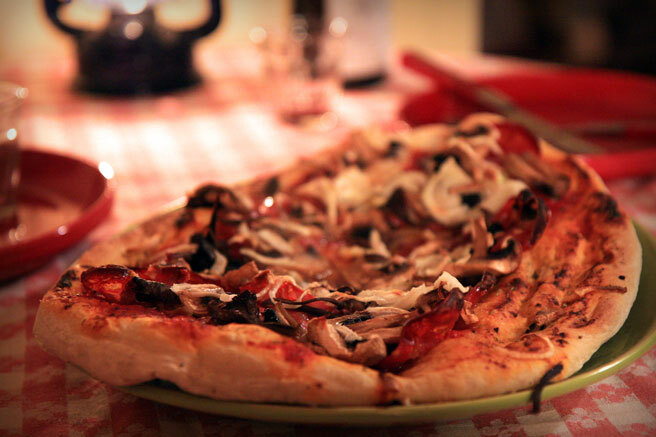 Your pizza, or should I say Bernadette's looks really, really, really yummy! I can just imagine savoring that pizza on a Saturday night. Bernadette is a great choice. Things sometimes do have a personality and thus deserve a name. I think my prize was getting to read about that pizza - I can almost feel my teeth sinking into that fresh-baked crust. mmmmmm. I call my dough starter names...It is like a pet to mee so I totally sympathise! I sense a wonderful book in the works. I only have one question: wouldn't Bernadette make a great baby name? Thanks for the comments! You know, Arne, we are saving a few names on the side for a baby. We found this almanac that gives the Saint's names for each day of the year, and I went through and underlined all of the names I thought were pretty. I underlined Bernadette. I was cooking dinner, we had the music going, and I had a glass of wine. Loic began reviewing my choices. He said: "Lucy... Do you really want to name a baby after our stove?!" "Well, I suppose we can rule that one out!" Tienes un blog fantástico, unas fotografías preciosas. Ha sido un placer llegar hasta aquí. Te invito a mi blog. Perhaps you'll make an outdoor bread oven one day and think of calling him Albert. What a wonderful couple they'll be. Although, my word, Bernadette appears to cook a pretty perfect pizza already. We like the name Albert, Doolz. Maybe the smoker.